Happy Inker: And Now... Card I sent to Tegan Swift!!! And Now... Card I sent to Tegan Swift!!! Well, Tegan received my cards, so I can post the one I kept a secret until she gets it... I used Pink Cat studio stamp. It is a very simple card, but the image itself is so wonderful, it doesn't need a lot more. The image was coloured with Copics, cut out and popped on dimensionals, and each flower on the hat has a little "gem". A little bit of sewing (I am not very good at that, I have to practice, lol). some piercing and one of my favourite colour combination - pink and brown. That is it for tonight. Blog you later. This is so stinkin' cute! I think your sewing looks fine. Great job! OOOOOo...this is so cute. I came to see you from SCS. You were the post above me. Love your blog!!! You're making me really want some owl stamps! Wow Dragana ... this is just so adorable!!! 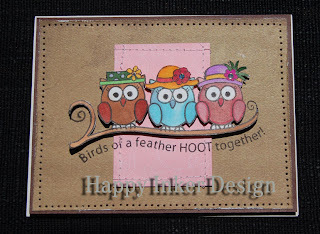 I love how you coloured the owls with your copics, and popping the image up on the card ... fantastic!! This is sooooo adorable! Love the owls and how you colored and popped them up! 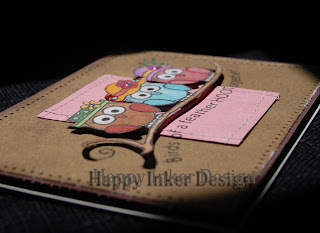 I love how you coloured the stamp Dragana! Great job!! Thanks for visiting my blog...I had to come see you!! Oh my goodness....this is the most adorable owl card ever! I just love the colors, the gems on the hats, and the sewing. Beautiful work!